Do you think about having a new kitchen designs? Do you need something attractive and simple? This article is the right solution to begin with. Your kitchen is your kingdom, you need it to be catchy and at the same time functional with simplicity. The modern minimalist kitchen is the solution for your needs and desires. 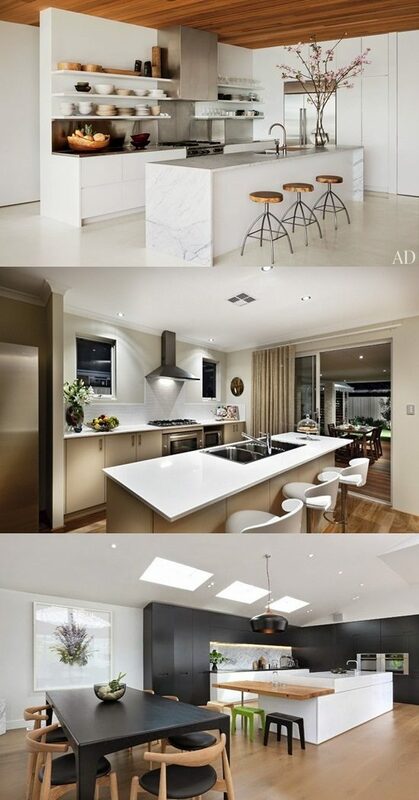 The minimalist and modern kitchen is about simplicity, elegant look, functional and open. To get the right combinations, you need to consider your kitchen items carefully; a backsplash, a cabinetry, shelves, countertop, appliances and even simple accessories. You should pick the perfect quality materials and designs to get your desirable look and don’t even forget that the contrast of colors is very important factor to get whatever you want especially the simple modern look. The perfect achievement of this design is to have simple clean lines of the items and plain catchy colors like black and white. The best feature about this attractive design is that it is characterized with a geometrical structure and a glossy finish. The glass is also an important item used for decorations like the backsplash, shelves, front panels, handles or cabinetry doors. Then you should also select a perfect modern countertop and there is nothing beautiful and practical as a granite countertop. The granite countertop has many shapes, sizes and colors as you wish. But for this minimal and modern design, you may opt for a black granite countertop which will be stylish and it is durable and functional as well. Your cabinetry needs to be with bright color “white or cream” to add a well contrast. The other items to consider are the appliances, lights, floors and simple accessories to complete the overall look and beautify the functionality of your modern minimalist kitchen. The appliances are preferred to be with high technology and keep what you already need. The color is not so difficult to choose you should go for stainless steel “silver” or black ones with stainless steel frames. Bright or natural lights are amazing to brighten up the look and the black & white tiles flooring will rock the whole modern look.